A flurry of recent deals and announcements in Pickering, Ont., bodes well for the economy of the Durham Region city of 94,000 east of Toronto. “We’re very, very excited about the development in Pickering and for the opportunity for more development moving forward,” Mayor Dave Ryan told RENX in an interview. Ontario Gaming GTA LP, a partnership between Great Canadian Gaming Corporation (GC-T) and Brookfield Business Partners (BBU-UN-T), announced on April 3 that it’s proceeding to municipal permitting for the Durham Live entertainment complex. Toronto-based developer Triple Properties acquired the approximately 240-acre site, located at the corner of Church and Bayly Streets off Highway 401, from Runnymede Development Corporation a few years ago. The Durham Live development, expected to cost approximately $1.3 billion, will include a casino, indoor water park, film studio, hotels, restaurants, convention space and more. It’s anticipated the casino, which will be built first, will be operational by late next year. “It will become one of Ontario’s top tourism destinations and entertainment sites,” said Ryan. CBRE Land Services Group executive vice-president Mike Czestochowski and senior vice-president Lauren White led a team that earlier this month brokered deals for two Pickering properties which are part of the provincially owned Seaton lands. CBRE was enlisted in 2016 to sell approximately 1,200 acres of Infrastructure Ontario-managed land in Seaton, with approximately 308 acres for residential and mixed-use, 834 acres for employment and 56 acres for community uses. Proceeds from the sale go to the Trillium Trust, which helps fund transit, transportation and other infrastructure projects across Ontario. Upon completion, Seaton is expected to be a mixed-use community which will be home to 70,000 and support 35,000 jobs. Mattamy Homes, TACC Construction Ltd., Paradise Developments and Fieldgate Homes formed a consortium called Seaton TFPM which purchased 397.4 acres located south of Highway 7 and west of Sideline Rd. No. 18 for $156.67 million. Two-thirds of the site will be dedicated to multi-density housing and one-third will be for employment uses. The City of Pickering had purchased 27.3 acres of industrial, commercial and investment land in Seaton north of Whitevale Road and west of North Road for $2.8 million a day earlier. “We recognized all along that residential growth had to be balanced by industrial,” said Ryan. “Without that economic base, we become a super large bedroom community. Most recently came the April 13 announcement that the City of Pickering had finalized agreements with three companies in the “Pickering Innovation Corridor,” which is comprised of development land located along Highway 407 between York-Durham Townline Road and Brock Road. The City of Pickering purchased 28 acres from the province and optioned 197 acres of innovation corridor land in order to directly market, sell and manage economic development opportunities. The Seaton Landowners Group is comprised of Mattamy, DG Group, Lebovic Homes and White Sun Developments. Tractor and heavy equipment manufacturer Kubota Canada Limited purchased 50 acres and will build a 500,000-square-foot warehouse and logistics facility and 65,000 square feet of head office space in its first phase. Kubota will invest approximately $67 million in the land and buildings. Construction is expected to begin this fall and occupancy should begin late next year. The campus could expand to more than a million square feet in future phases. Red Crest Developments purchased approximately 5.5 acres at $100,000 an acre. It will build two adjacent office buildings totalling almost 300,000 square feet that will present leasing opportunities for businesses of all sizes. Ryan said, to his knowledge, Red Crest doesn’t have pre-construction tenant commitments but feels confident in moving forward with its development. While the City of Pickering is attempting to attract energy, environmental and engineering companies to the innovation corridor, it’s open to other opportunities as well. The Behar Group purchased approximately 25 acres at $100,000 an acre. 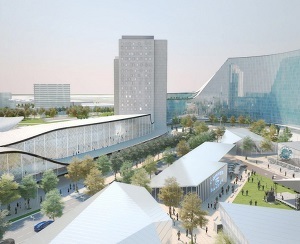 It will build a four-star hotel with an adjoining 30,000-square-foot convention centre to accommodate industry conventions, trade shows, corporate meetings, weddings and social events. The federal government owns thousands of acres of land immediately north of the Seaton community which were expropriated in the early 1970s, with plans to build an international airport that has yet to come to fruition. Ryan, however, is optimistic it will be built. Toronto Pearson International Airport in Mississauga is expected to reach capacity within 20 years, and it takes at least 10 years to develop a major airport. “The federal government has commissioned what they tell us is going to be the final study through KPMG,” said Ryan. “It will be doing a full financial analysis of the potential for those lands. “We think, from the work that we’ve done and other studies that have preceded this, that there’s going to be no question of the economic viability of those lands. To realize their full potential, the right solution is to move forward with the airport development.